Anderson PowerPoles are the new ARES and RACES standard for power connections on equipment. Having and implementing the standard allows equipment from different sources to be used without having to be rewired due to mismatched connections. The information presented here is compiled from several sources to provide a guide for the proper assembly of PowerPoles. PowerPoles consist of plastic connector housings and contact pins. The picture at right illustrates the ARES /RACES standard orientation. This configuration is also used on RIGrunner type accessories sold by West Mountain and MFJ. The housings have a dovetail so the housings can be connected to each other. The housings come in several colors and can be assembled in many configurations, so be sure the housings are connected in the ARES standard orientation. Assemble the housings by sliding the dovetails together before inserting the contact into the housing. This is especially true when using paired cable. They fit snugly and can be difficult to get apart. When crimping the contact pins onto heavy paired wire, orient the contacts so that they are both facing the the correct direction so that they go in the housings without twisting the wire. Orient the wire with the red/plus wire on your right with the end of the wire away from you, as shown at left. Place the contact pin on the wire so that the sharp edge of the contact tip is down. Do both contact pins this way and when crimped they will fit in to the plastic housing correctly without twisting the wire. Before crimping, trim the insulation back 5/16". A good crimp is one where the dimensions of the crimped portion are no more than an uncrimped pin. If the crimp is flattened out you will not be able to easily push the pin in to the body. 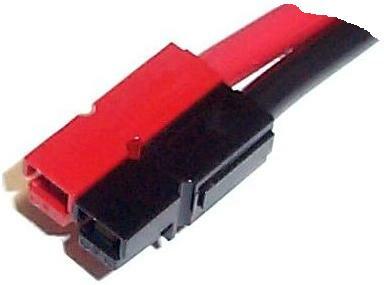 Use a crimping tool that contains the wire completely inside the pin and doesn't spread the connector apart. A properly crimped contact should have a minimum hold on the wire of more than 25 pounds. Straighten the contact pin if it is bent relative to the crimp area before inserting it in to the housing. The contacts go in the housings in only one way. Insert the contacts with their sharp edge down against the flat spring that is in the housing. They should slide in and click. If you do not hear a click or they are not fully seated, fix them. When they are inserted fully you should notice that the contact and it's wire "floats" slightly inside it's housing. If it feels tight it may not be snapped in fully or you have made the contact wider than it originally was during crimping or soldering. Tug slightly on the assembled connector to make sure the contacts are locked in place. Last but not least, MAKE SURE you have the polarity correct before plugging in you equipment. "Measure twice, cut once" as the saying goes. Using the red and black housings in combination with red and black paired cable helps make this a foolproof process. There has been some discussion on various web sites about securing the housings together, and not relying simply on the dovetail. Some concern is raised about using spring (roll) pins that some vendors supply. If the spring pins fall out, it could cause other problems or damage. An alternative is the spiral (roll) pins. Spiral pins are more expensive, but may hold better. Using glue on the dovetail joints makes the housing connection permanent. Heat shrink tubing on the housing and the wire can also provide a solid connection. West Mountain packages PowerPoles in a pack of 12 "pairs". Each "pair" consists of a black housing, red housing, and two contact pins. You would use two "pairs" for a complete connection. The current AES price is $10.99 for the (C30/PK/12) set. A bulk source is H.M. Cragg in Bloomington, MN. They sell the components individually and have a $25 minimum, which is the equivalent of 30 "pairs". Because the size of the finished crimp is critical to a successful assembly, be sure to use a good crimp tool. These can be $20 at Home Depot. West also has a crimp tool available from AES (CR/TOOL) for $9.99. An alternate is Harbor Freight, which sells a good quality tool (#36411) for $6. In addition to the crimp, there is a die area to round out a flattened crimp. Unfortunately, there is only one Harbor Freight store in the Minneapolis area. Finally, Cable Xperts is a source for the red/black paired cable. The AZ-12 cable is available from AES for $0.29 per foot, or $19.99 for a 100-foot spool. AZ-12 is 12 gauge and rated for 21.6 Amps. You can also get AZ-14 (14 ga.) rated for 16.2 Amps, AZ-10 (10 ga.) rated at 28.2 Amps, and AZ-8 (8 ga.) rated at 39 Amps.